Have you ever been lost when you try to build basic stock before high sales season? 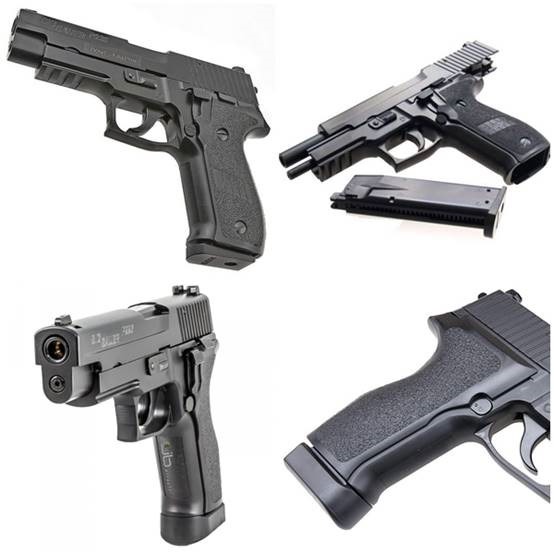 For the coming Xmas, Jia Dyi suggests 3 brands of P226 replicas to bring customers in your stores. The article represented three appeals to varieties of customers’ needs which are worthy of planning- individual user’s physical difference, system orientations, and purchasing motives. 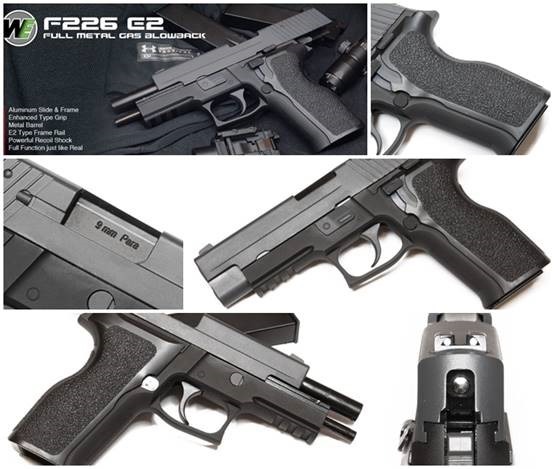 WE P226 Pistol has three models with gas system-【GP427-N】without rail,【GP427】also called P226R, with tactical rail, and【GP427-E2】also for its E-square：Enhanced Ergonomic design in slim trigger and hand grip. It is natural for E2 not to share the same mags with the other two models. Above was WE P226R,【GP427】,you can tell from its wide pistol grip with screws. Above was WE P226 E2,【GP427-E2】.The characteristic for its 3 models is they share the same ergonomic trigger. For players with small/medium palms, Jia Dyi recommended WE P226 E2,【GP427-E2】. 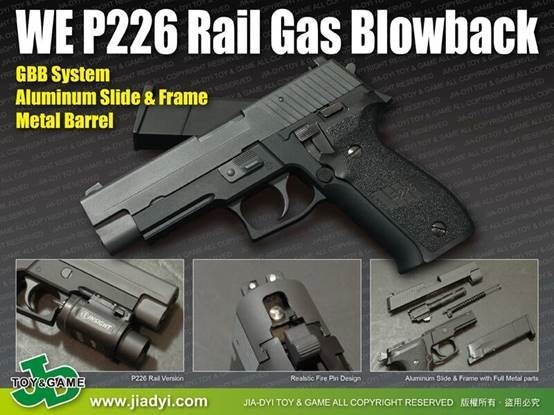 KJ P226 owns two models with two systems-【GP404】and【GP404-E2】for green gas, and 【CP404】and【CP404-E2】for CO2 system. The two green gas versions also do not share the same magazine, they are【MG-P24】and【MG-P24E2】,but the two CO2 guns own the same CO2 magazine,【MG-P24E2C】. It is also not a good idea to quickly convert into a different system by replacing gas mag with CO2 mag on KJ P226 gas pistols. The upper two pictures were KJ P-01 with gas magazines, the other two pictures were KJ P-01-E2 with CO2 magazines. Jia Dyi will recommend KJ P226 CO2 system,【CP404】,for the merits of：1. Right trigger shape, 2.Stable output in cold weather, and 3.Easy to carry CO2 cartridges. 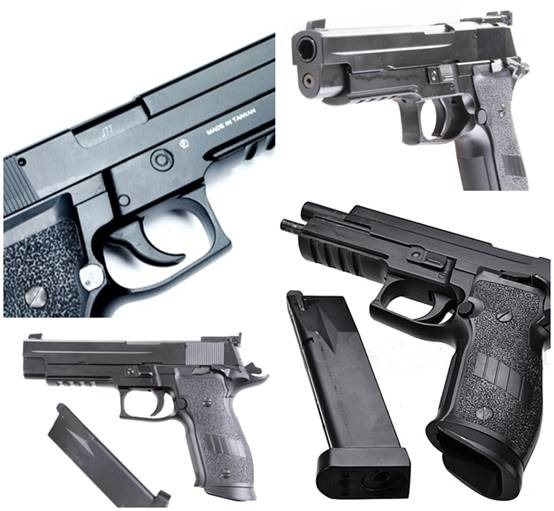 KWC owns the most of options for P226, from the cheap spring gun model without HOPUP,【KA-15N】,and silver【KA-15CIN】, to the hop up version【KA-15NH】and silver【KA-15CIHN】. The CO2 models, which carry blow-back function are 6mm【KCB-74AHN】and 4.5mm【KMB-74AHN】. They can be promoters or gifts for fathers’ sons. KWC has a unique “skirt” on the magazine-loading edge of grip for the two blow-back guns, it makes KWC P226 more like a competition pistol. In addition, KWC do not carry E2 style grips, so sticking with the "fat" trigger makes it correct in outer appearance on all models. Jia Dyi also carries P226 replica guns from other brands, like KSC/KWA/HFC/SRC. We want to bring you as many choice as possible while providing the pro and cons. Let Jia Dyi helps you to build a flexible product portfolio, respond to market more efficiently, and develop roadmap for the profile of your shop, try me and contact at sales@jiadyi.com. We won’t fail you.